Despite living in Cambodia for over a year we still haven’t posted anything about two of its most important sites. It’s been 10 years since we visited S21 Prison and The Killing Fields in Phnom Penh and my fading memory won’t enable me to do them justice. Instead, Amy Poulton from Page Traveller has written a fantastic, insightful post on this subject for me. Note: Amy chose not to take any photos at the sites out of respect. The few images in this post have been sourced and are licensed for reuse. Cambodia is a beautiful country with a rich history, home to the impressive ancient city of Angkor. Yet, some of Cambodia’s modern history is much more tragic. Two difficult but important places to visit are Tuol Sleng Genocide Museum (S21 Prison) and Choeung Ek Killing Fields (The Killing Fields). These are both in the capital, Phnom Penh. 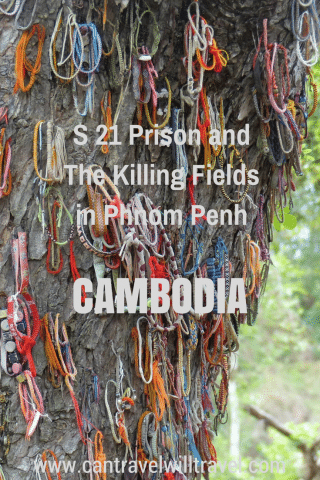 This guide to visiting Cambodia’s more affecting sites includes background information on the Khmer Rouge and Cambodian Genocide, my personal experiences visiting these sites and some advice for how and why you should plan to visit S21 Prison and The Killing Fields. Trigger warning: this post contains some disturbing information about the Cambodian genocide, including violence, murder and sexual assault. After Cambodia fought a ten-year war of independence from the French and while Vietnam fought for and against communist rule; the Cambodian Civil War raged for eight years until the Khmer Rouge emerged victorious in 1975. The Khmer Rouge, also known as the Communist Party of Kampuchea, formed an autocratic and repressive regime that devastated the country, created a famine and carried out a genocide. Under the rule of the Khmer Rouge, it’s estimated that 1.5 to 3 million people were killed, which was 25% of Cambodia’s population at the time. Around 200 execution centres, such as infamous Security Prison 21 (S21) at Tuol Sleng, were set up to torture enemies of the Khmer Rouge. When the torture finally produced a confession, prisoners were executed at nearby Choeung Ek. The Khmer Rouge was eventually removed from power in 1979 and the horrors of the regime were finally revealed. 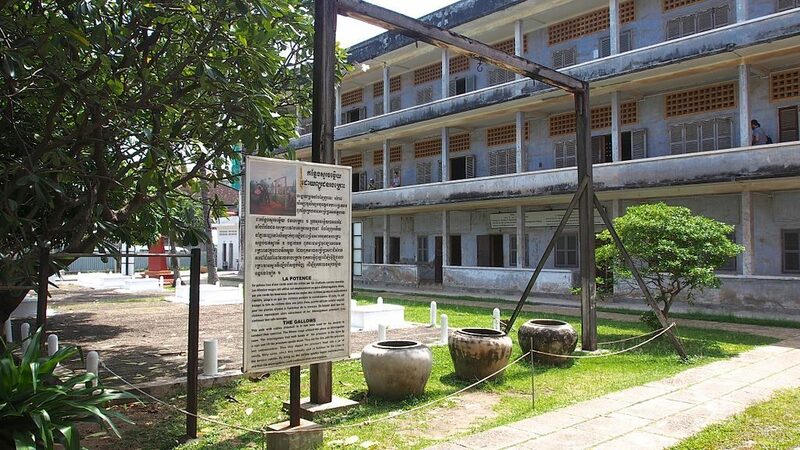 Today, S21 is now the Tuol Sleng Genocide Museum and Choeung Ek is now a memorial site known as The Killing Fields. Both are difficult, but important places to visit in Phnom Penh. Khmer Rouge: Another name for the Communist Party of Kampuchea. Khmer is the name given to someone from Cambodia and to their language; whilst Rouge (French for Red) is the symbolic colour of communism. Kampuchea: The historic name for Cambodia. Pol Pot: The notorious leader of the Khmer Rouge and former Prime Minister of Kampuchea. Angka: ‘The Organisation’ – the name of the ruling body of the Khmer Rouge. Under the Khmer Rouge, ‘old people’ such as farmers and working-class citizens were revered over ‘new people’, such as intellectuals and city dwellers. The ‘new people’ were sent to the country for hard labour or sent to a prison to ‘confess their sins’. People were arrested simply for having an education, speaking another language, or even for wearing glasses. Tuol Sleng was once a secondary school, but the site was turned into a prison to torture such dissidents. It’s estimated that 20,000 people were taken to S21 during the regime. Once they agreed to and signed a confession, prisoners were then taken to Choeung Ek Killing Fields to be executed. When Tuol Sleng was finally liberated, only seven living prisoners were found at S21. These people were photographers, mechanics or painters, kept alive for their skills; as well as a few children who had managed to keep out of sight. Needless to say, visiting S21 is heavy going. Since liberated the museum has been pretty much untouched and a visit there is not for the fainthearted. I felt like I was visiting a haunted house, except I had to keep reminding myself that what I was looking at was real. Something incredibly haunting about S21 is that every prisoner was documented and photographed on arrival. These photographs are now on display and there are thousands of them; men, women and children. Looking into their eyes is devastating. For Khmer Rouge survivors and family members trying to track down missing relatives, they must look through every single photo in the archives. There are also exhibitions on the upper floors about survivors of the regime, forced marriages, rapes and other atrocities. I planned to visit the S21 for a couple of hours but ended up staying for around four. I listened to every single track on my audio guide. Something that really got a lump stuck in my throat was that one of the few survivors of S21 now works at a bookshop on the premises. He’s even written a book based on his experience. Around 10 kilometres outside the city of Phnom Penh is the site of Choeung Ek, now known as The Killing Fields. This was where the prisoners of S21 were transported to and executed. They were told they were being moved to a new home, so as not to cause alarm. The mass graves of The Killing Fields have since been excavated and exhumed. However, the ditches remain and fragments of teeth, bone and clothing still come up to the surface today. The atmosphere at The Killing Fields is very different to the atmosphere at S21. When I arrived, having just come from S21, I was preparing myself for more heartbreak. A tall memorial structure stands in the centre of the museum grounds, housing 9,000 skulls of some of the victims killed at Choeung Ek. Although the stories on the audio guide are still horrific, the experience is very different to visiting S21. The surrounding areas were quiet and serene, the grass was green, the smell of incense was in the air and birds were singing. Children were playing football outside the gates of the museum. 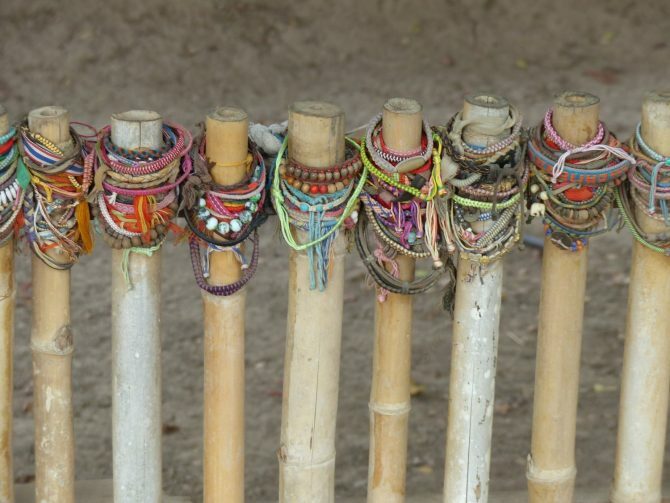 Colourful bracelets are placed in memory of those who died with messages of peace and traditional money offerings were scattered on the ground. The atmosphere is tranquil; it feels as if the people who died here are finally at peace. It is a personal choice whether to visit S21 and The Killing Fields. However, I believe that – though both are shocking, heartbreaking and difficult to visit – it’s important to push past feeling uncomfortable to educate yourself about the darkest periods of global history. This ensures that those who suffered are remembered, what happened is never repeated and you have context for what Cambodia has been through. I only visited these sites for a day, but the memories of what I learned there will stay with me forever. Here’s all the information you should need to plan your visit to S21 Prison and the Killing Fields from Phnom Penh. Itinerary: I highly recommend that you spend one full day visiting the two sites; you will need more time to digest the information than you think. Get up early and head to S21 first, then finish the day at The Killing Fields. I would advise not to plan anything for the evening of your visit, as you might be very affected by what you see and learn. Also, be sure to dress appropriately by covering your legs, chest and shoulders, out of respect. 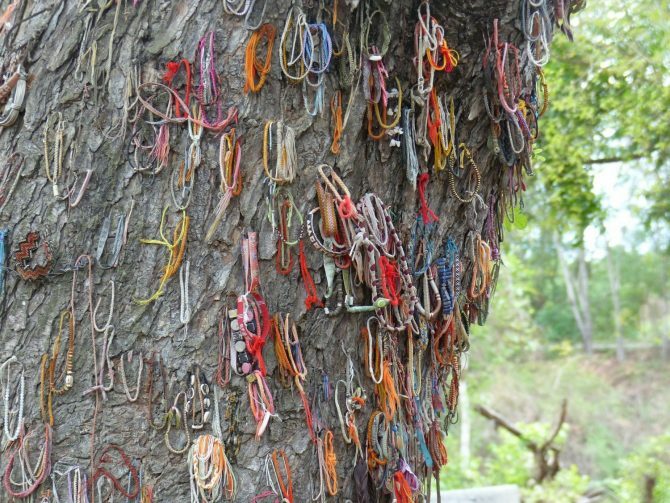 At the Choeung Ek memorial, you may be requested to remove your shoes. Transport: I rented a bike from my hostel and cycled to and from the sites. However, Phnom Penh’s traffic is super-scary to cycle in and I underestimated how far out of town Choeung Ek is. Therefore, I recommend that you hire a tuk-tuk instead for about $15 – $20 USD (£10.50 – £14 GBP ) for the day, plus tip. Tours: There are plenty of tours available should you wish to go with a guide (around $15 USD per person). Personally, I preferred to go alone and use the audio guides available, so that I could go at my own pace and take in the information at my own speed. There is also a guide service at S21. Costs: Entry to S21 is $5 USD (£3.50 GBP), or $3 USD (£2.10 GBP) for under 18s with an ID. Entry to the Killing Fields is also $3 USD. Audio guides are $3 USD at both sites and guide services are available at S21 for $2 USD (£1.40). Note that these prices are subject to change. Yes, the Tuol Sleng Genocide Museum (S21) and the Choeung Ek Killing Fields are difficult to visit, but I hope this guide has helped give some context to the sites and to Cambodian history. Amy is a bad Brit, but a badass bookworm. 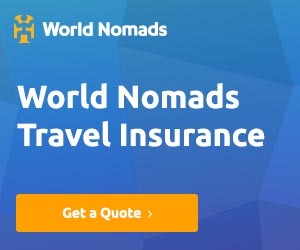 She has lived in Hong Kong, Italy and Mexico, as both an expat and digital nomad. She writes about her love of exploring real and fictional worlds at Page Traveller. I hope this post encourages you to visit these two places and has offered some helpful advice on how to prepare yourself and how to be respectful during your visit. Awesome post Amy! Many people only share the beauty of Cambodia. Thank you for sharing another side to help me understand more about the history and sad past. When planning a trip to Cambodia I had always only the beautiful temples in mind. I didn’t know about the history of Cambodia until reading this post. But I am planning a visit next year and I feel like everywhere I go it is important to not only learn about the culture and the food but that history is an important part of understanding a country. I will include the S21 prison and also the killing fields in my itinerary. Thank you for putting together such an informative post. Unfortunately my visit to Cambodia was quite short. But, I would love to go back to explore more of the country and these sites would be on my list. Though I’m sure they are thought provoking and depressing, I feel its important to honor the past and to remember the past so that we do our best to not repeat. Absolutely, travelling isn’t just about all the amazing sites and experiences, it’s about understanding a countries history and culture as well. Also like you say learning and doing our best not to allow such atrocities to be repeated. Great post, Tanya and Amy. I lived in Phnom Penh for a year, so I got to know Cambodia pretty well. I agree with you that visiting these sites is difficult but necessary. I hope this encourages more people to go and learn about Cambodia’s not-so-distant past. Thanks Emily, Cambodia’s a wonderful place to live for a while isn’t it. I think knowing the history and what the country and it’s people went through is so important. It never ceases to amaze me how happy, smiling and friendly Cambodians are despite all they’ve been through!